WITH a couple of seasons’ experience, Emily has just two trout to show for her efforts. It’s no surprise that she’s beginning to despair a little. But, the fact that she has continued fishing at all, even though most of her sessions had drawn a blank, is a good indication of her dedication and determination. Arriving at Combe Sydenham fishery, in West Somerset, we check out Emily’s fishing gear. Previously, her tackle proved a little heavy so I suggest one of the new Greys GRXi rods, rated 5/6 with a reversed half wells handle, ideal for the smaller hand and not too tough on the wrist. Very quickly Emily found the Greys to her liking, as it’s much lighter than her usual blank, so we set about working on casting for a quick half hour. Emily’s main problem is a lack of timing on the back cast and releasing the line a little too early on the final shoot. This is soon corrected and so it’s time to sort out Emily’s real dilemma, the fact that she spends more time looking into her fly box trying to decide what pattern to use when actually fishing. Emily’s fly box is a mass of assorted colours and disorganised. Lures are mixed in with nymphs and dries with wets. The result is a confusing mess that Emily can’t make sense of. I really enjoy organising my own fly boxes, sorting through the rubbish and filing flies away carefully in ordered groups, making for easy identification and allowing quick changes when required. While grouping Emily’s flies I point out the difference between the various categories, breaking them down into Lures, Nymphs, Damsels, the Buzzer Lifecycle, Traditional Wet Flies and Dry Flies. Soon the fly box takes on a different appearance. Many of Emily’s patterns originate from a large bargain pack purchased when she first started out and while many patterns are quite fishable, plenty have bulky bodies or too much dressing. I explain that much of the trout’s diet is fairly delicate and that sparse patterns out-fish their gaudy cousins tenfold. There are also many traditional patterns in circulation that do catch fish but, with modern day manmade materials such as holographic tinsel widely available, it’s now possible to purchase flies with an “x factor” many fish find hard to resist. To demonstrate this I pick out an old style Buzzer and a Sweeney Todd. Both will catch fish but against the modern Cormorant and Superglue Buzzers they look dated. Many of Emily’s flies are tied on far from perfect hooks. The points actually curving inwards on many of them, therefore reducing the gape. She says that several fish had come unstuck during play in the past and it was quite likely down to this inferior hooking ability. 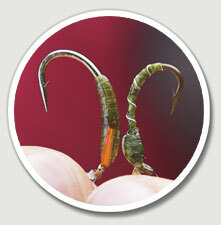 Decent flies may cost a few pence more, but, the result is often plenty more fish in the bag. The alternative and a great way to keep costs down; tie your own flies, which also allows them to be customised easily. Flies sorted, it’s time to get fishing and to show Emily how to pick flies according to conditions. But, before we do this we check out her leader that she is happily constructing from one strand of mono, just a few feet in length! I explain that the fly needs to be positioned well away from the fly line and that this is the job of the leader. It’s also wise to taper leaders to enhance turnover using differing breaking strains starting from 12lb and working down to 6lb test. Leaders should also be a minimum of 10ft in most circumstances and I find myself using 12ft to 14ft more often then not. Emily’s flies had been so close to her line on many occasions that it was no wonder the fish were not taking. Before casting we take a walk around the lake. Combe Sydenham is a new venue for Emily and so it is all-important to check what options are available and then have a plan for the day. This may sound a little regimented or military, after all we are supposed to be enjoying ourselves, but many anglers seem happy to stay in one spot all day then moan when they don’t catch. Small waters are less testing than reservoirs in this respect, but it’s still wise to move around trying different areas and covering a variety of depths and features. Working out the depth of a fishery can be done with sinking lines and counting down once cast, while another trick is to use the rod as a makeshift measuring device, but don’t break the rod tip when practicing this method. Combe Sydenham is very deep, especially near the dam end of the two main lakes (Sir George’s or Lady Elizabeth’s Ponds) and as the air temperature is cold I explain that fish are probably lying deep, making use of a warm layer of water, so we just need to get a fly down to them. A sinking line is a natural choice, but as Emily is using a light rod not suited to fishing sunk lines, we opt for a long leader and then the first of our fly choices, a Damsel sporting heavy dumbbell eyes and a long, flowing marabou tail. To fish this fly is easy, throw it out, count down for a good while allowing the long leader to do its duty and then start experimenting with the retrieve. The fishing certainly proves slow, but rather than sending Emily back to pore over the fly box I explain that all she need do is continue to experiment with retrieves and depth. Flies are certainly important but Emily’s fishing had been revolving around the choice of pattern and not finding the fish. It may seem obvious but all the best flies in the world will lead to little success if the fish can’t see them in the first place. A chat with Combe Sydenham’s manager, Jim Laver, reveals that the deep water has produced the most fish and so I am not surprised when Emily lets out a sudden shriek of delight, the Damsel has worked. Despite her lack of fish catching action Emily deals with the fish perfectly, keeping the rod high and only allowing the fish to take line when it pulls away hard. Emily looks pleased and is surprised to catch a fish on such a dull looking fly; most of her previous selections had been based around the biggest or brightest fly in the box. With her fish safely in the bass bag I show Emily the contents of my Wasatch Tech Pack by Fishpond. The pockets doubling as useful fly storage and set out as lures, dries, nymphs and buzzers, ready for super quick changes when required. Rummaging through the mountains of flies in a few of my spare boxes I pull out some slightly more specialist patterns. A Parasol Buzzer to use when the pupa are just below the surface about to hatch, some sight indicators when fishing Buzzers fished across the wind and also a couple of fry patterns, a must have when fishing many large reservoirs in autumn. Other back up flies include Corixa, Daddy Longlegs and perhaps a Shrimp or two, but in the main go with Buzzers, a few nymphs including Damsels and some lure variations to cover most options. The trick is to keep your stock well ordered and give each fly at least half an hour to work, otherwise we spend more time out of the water tying knots than in it catching fish! Now Emily has caught, I try my luck. In cold water the fish don’t want to see the fly moving at speed, so the long tail of a Damsel pulsating enticingly is more than enough to attract their attention. When stocking a fly box, always remember to have a good selection incorporating movement, such as Tadpoles, Damsels and various other patterns tied with marabou feathers, picked out fur bodies or long webby hackles. The Combe Sydenham fish certainly agree, as an aggressive take signaled that another fish had fallen foul of the long leader and Damsel approach, so simple and yet so effective! Our corner goes quiet and we see several fish follow in and turn away, curious enough to pursue the fly but perhaps on their guard now that a couple of their friends had gone missing. This calls for a fly change, obviously we are at the right depth because fish are following, but something is wrong. The leader is of a good length so it has to be the fly, or possibly the retrieve? A change to a Black Tadpole tied over a lead underbody gets instant results at exactly the same depth and speed, proof that fish can become wary of a fly once they have seen it too often. I explain to Emily that this is why we keep selections of alternatively coloured Buzzers, Diawl Bachs and similar popular imitative patterns, not only to mimic the colours found in the naturals but also to allow for changes when the fish have grown wise to a particular shade. Heading to the top lake I hand over my slightly heavier rod, a 9ft 6in Greys GRXi rated for a 6/7 line, possessing good reserves of power and ideal for throwing sinking lines. The fish are taking deep so the obvious choice is a sunken line. Emily certainly finds the bigger rod tougher going, but before long a fast sinking line is covering a decent section of water and once again we resort to the Damsel that had produced on the lower lake. Sinking at around three inches per second our line is soon among the fish and before long Emily is beaming again as the rod dances to the tune of another Combe Sydenham beauty. That’s it, Emily has gone for a three fish ticket and the limit is complete! Emily could not believe the results from actually keeping the fly in the water and choosing patterns logically, rather than opting for any old thing resembling a Christmas decoration. I learned so much that I’ve bought two new rods and joined my local angling association. I was surprised that the most successful fly was a dull Damsel Nymph. The brightest or prettiest fly isn’t always the best. Today, I caught two fish. It took me two years to achieve this before my tuition day.